Labaton Sucharow doesn't just hire outstanding female attorneys. We help build them. Through our practices and programs, from recruitment, development and recognition to our Women's Networking and Mentoring Initiative, we provide an environment that fosters growth, leadership, and success for our female attorneys. Recognizing that opportunities for advancement and collaboration have not always been equitable to women in business, Labaton Sucharow launched the Women's Networking and Mentoring Initiative in 2007. Since then, we have been host to dozens of exceptional guests, including senior executives from a wide array of commercial markets, as well as leaders in politics, law, and global not-for-profits. Partners Serena P. Hallowell and Carol C. Villegas serve as co-chairs of the Firm's Women's Initiative. On September 28, 2018, the Women’s Initiative hosted an event featuring two all-star panels that included some of the country’s leading women asset allocators and fund managers to address current trends, compelling reasons to include diverse managers in a portfolio, and ways to improve visibility for diverse managers. 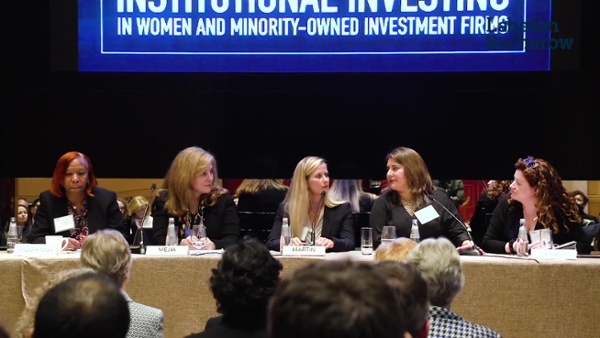 Held at the Four Seasons in New York, the event was designed to foster the discussion around the important topic of how institutional investors can invest in and build relationships with women and minority-owned investment firms.